Here we are, already in the last few days of April! It's time again for my monthly free educational printable. I have so much fun coming up with these each month! Of course with the gorgeous weather outside, I had to go with a spring-themed printable this month. This is the time of year when teachers and students alike are counting down the days, getting desperate for that hard-earned summer vacation. While I can't do anything to speed along the last month of school, hopefully this cheery spring printable will brighten up your classroom a little bit. It's an easy, self-explanatory activity. No one is in the mood for anything complicated this last month of school. This is a perfect activity for students to complete independently when they are finished with other work, as a center, in a small group, or when you have just a little bit of extra time to fill. This is a noun and verb sorting activity. Students simply cut out the petals and glue them to the appropriate flower. Of course, I couldn't make it too easy for them, so I threw in a couple of extra petals that have neither nouns or verbs on them. 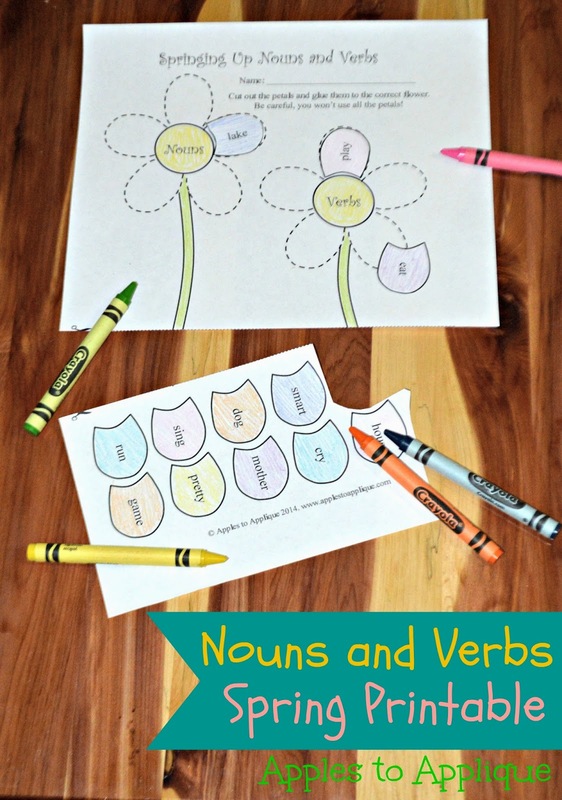 For students that are just learning nouns and verbs and may be confused by the adjective petals, just tell them up front which ones they won't use and have them cross them out. I hope you and your students or kiddos enjoy! Download the activity below. This is my first time using Google Docs for my printables, as Blogger does not allow for the uploading of PDF files directly, so let me know what you think! I think the quality will be better than the JPG files I have used previously, but would love to hear your feedback. Please feel free to share and copy the printable. All I ask is that you credit Apples to Applique for the artwork and leave the copyright at the bottom of the page. Thank you! Cute printable! Simple and straightforward activity, but so useful. Thanks! I like useful activities for kids that are also easy to use. These are so cute! I'll have to pass them along to my sister for her kiddos! Thank you! These would be great for at-home practice. Aw, this is so cute! I don't have kids, but it definitely looks like something I would have loved when I was little :) So cute and spring-y! Thanks Amy! When I design printables I try to think back to things I would have enjoyed as a child, too.